My experience this year was pretty good in general – I kept up on what was going on with the Fans of Gen Con group on Facebook, which was full of good information. 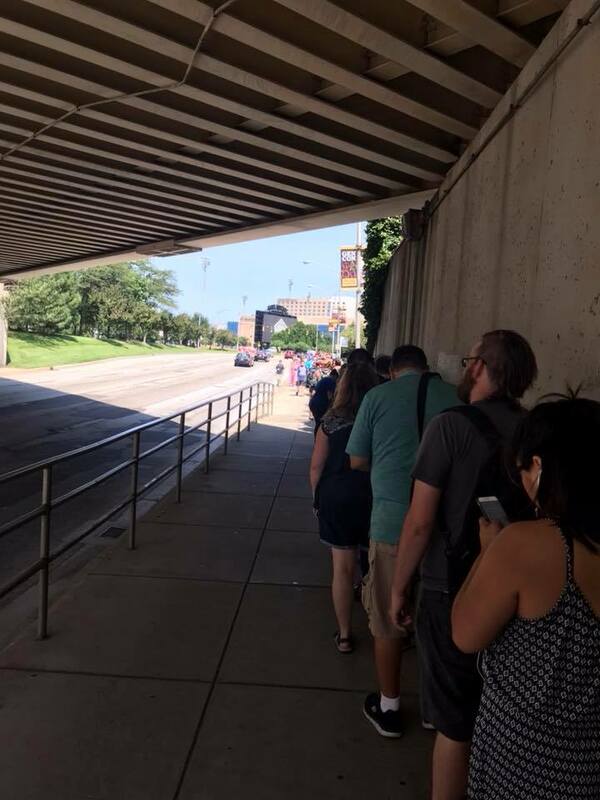 From where to find certain games to how long the line for Will Call was, the folks in Fans of Gen Con posted about it all – and it helped me feel a little more connected to the convention in general. I’m hoping I can actually make it to their pre-Gen Con event next year, the Stink, so I can meet more of the great folks in that group. Speaking of Will Call – what the heck was up with Will Call this year? The lines were insane, from what I heard – this year I ended up getting my press badge with my friend Rachel (of The Five(ish) Fangirls Podcast) on Wednesday, and then hopping into the Will Call line – which stretched almost entirely across the convention center. It moved pretty quickly, though – Ross, Rachel, and I were only in line for a half hour. However, Thursday was an entirely different story. This photo was taken by someone in the Fans of Gen Con group on Facebook, at around noon on Thursday. That was the end of the line – snaking almost to Lucas Oil Stadium. Apparently the line was really, really bad on Thursday – so much for Will Call being such a well-kept secret! I think Ross and I are going to plan on getting my press badge on Wednesday of Gen Con from now on, so we don’t feel so rushed trying to get things taken care of early Thursday morning (and so we avoid the potential horrors of the lengthy Will Call lines). I don’t know about everyone else, but it felt like some parts of Gen Con were ridiculously packed compared to last year. It felt almost impossible to navigate the Block Party, where all the food trucks were congregated, during meal times (and forget about finding a place to sit!) – and the dealer hall was insane on Sunday. I get easily overwhelmed when there are too many people somewhere, and while most of the time I was fine, there were some spots where I just got so overwhelmed by the sheer amount of people crammed into a small area. Unfortunately, I have no idea how to alleviate this outside of finding a new place to do Gen Con or expanding further into the surrounding hotels – it’s just something I guess I’m gonna have to deal with. I will say, watching the crowds enter the dealers hall on Thursday morning was fascinating. I actually recorded the tail end of the opening ceremonies for Gen Con this year, and at about 4 and a half minutes into the video, you can see the crowd start pouring into the hall (and hear my silly commentary on it, too). One of the things I love about Gen Con is the fact that I can run into friends from pretty much every part of my life here – over the course of the convention, I ran into a bunch of folks from Kishar, friends from work, my wonderful mom-in-law and brother-in-law, and even folks from SIGUCCS (a professional organization I’m a member of). It’s like one big geeky party that all your friends are at, and it’s fantastic. I always love running into friends and family at Gen Con. Overall, I had a great time – I got to eat tasty food from the food trucks (including some pierogies from Pierogi Love, and a rainbow cupcake covered in glitter called “The Mike Pence”, haha), I got to wear a Sailor Moon costume I’d only ever dreamed about wearing before, I got to play in some awesome games, and I spent a ridiculous amount of money in the dealers hall (I bought a Utilikilt this year!). All in all, this was a great year, and I’m looking forward to next year’s Gen Con! Here’s a little taste of Gen Con 2018, in photo form. Googly-eyed Starbucks lady greeted us at badge pick-up on Wednesday. This is one way to keep occupied while waiting for the dealers hall to open! The Pathfinder/Starfinder room. Maybe next year, I’ll jump in on a Pathfinder Society game. Exploding Kittens brought back their vending machine! This sign made me giggle. Cardhalla on Friday! I’m slightly bummed that I didn’t get a picture of everything before they knocked it down. The Mike Pence. It was tasty. And glittery. A shot from the costume parade of Ross and I! 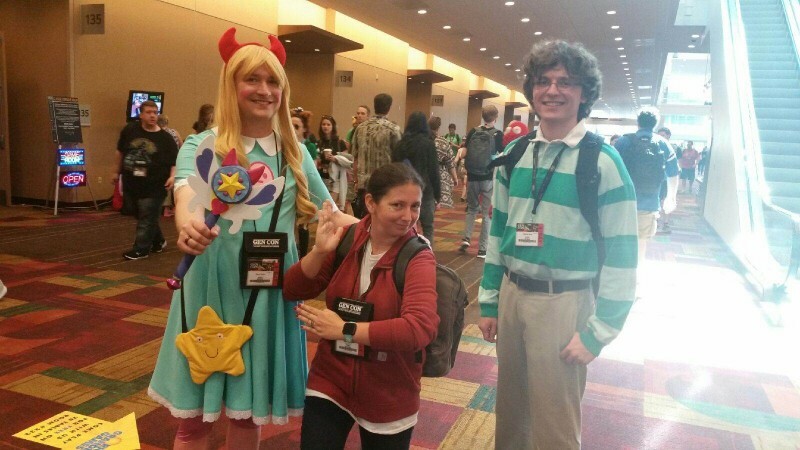 Keep an eye out for the more specific Gen Con Reports! 🙂 And if you want to listen to a more detailed (and much more tired) report about Gen Con, I guest-starred on the most recent episode of The Five(ish) Fangirls Podcast, where Rachel and I talk about our Gen Con experience!